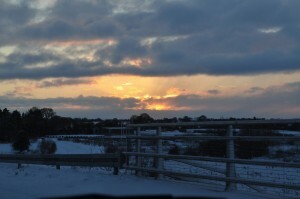 The end of 2010 is proving a cold one, as a whole week and a half of heavy snow gripped the country at the start of December. Widespread disruption to road and air traffic, the closure of the vast majority of primary and secondary schools nationwide for several days, and high rates of work absenteeism proved to be the main effects of the heavy snowfall. The combination of snow and slush mixed with sub-zero temperatures overnight, led to driving conditions becoming extremely treacherous nationwide, with salt supplies becoming scarce due to the heavy demand. Road gritters were out in full force in Dublin and the surrounding areas during the worst period, as temperatures plummeted to as low as minus 10C on several occasions. Seán O’Neill, spokesman from The National Roads Authority, has said that the State was using about 3,500 tonnes per 24-hour period to maintain the national network of primary and secondary roads. The Government’s emergency taskforce had curtailed transport services for the worst part of the ‘Big Freeze’, particularly along the east coast, with several bus routes being completely cancelled and those that were in operation ceasing at 9pm. In Dublin, all Luas services were suspended halfway through the day on Thursday, December 2, with operators citing tram-failures due to heavy snow levels on the tracks as the reason. Taskforce chairman, Seán Hogan, said that the objective of all agencies was to keep the primary transport networks and key strategic routes open for traffic, but the severity of the conditions meant this may not always be possible. All classes at University College Dublin, Trinity College, Dublin City University and NUI Maynooth were cancelled from Wednesday, December 1 to Friday, December 3. A whole host of sporting and other events around the State were also cancelled due to the heavy snowfall.